Mr. BURTON of Indiana. Madam Speaker, it’s late at night here in the Capitol, and most of my colleagues are in their offices or have gone home. But I want to talk about an issue that’s very, very important that we’ve been talking about now for the last 8 years. I was chairman of the Government Reform Committee for 6 years, and during that time, my grandson became autistic; and we checked to find out what was the cause, trying to find out, because my daughter and her husband were just extremely upset about it, as we were as grandparents. And we found that he had received nine shots in one day, seven of which had a product called themarasol, a preservative, in it. And the themarasol was 50 percent ethylmercury. And so I decided to have hearings to try to find out if the ethylmercury in those vaccines had anything to do with the autistic problem my grandson had. And we found, by having many, many hearings over a 4-year period, we found that scientists from all over the world and leading doctors and educators here that work with autistic children, that the mercury in the vaccines did contribute to the autistic epidemic that we had. We used to have one in 10,000 children that were diagnosed as being autistic. One in 10,000. Today the Centers for Disease Control will tell you it’s one out of 150. It’s an absolute epidemic in this country. And we have been fighting and fighting and fighting to make sure that those families who have been damaged and those children who have been damaged by autism get some kind of compensation. And that’s why, and I think in 1986 we passed what was called the Vaccine Injury Compensation Fund, and it took some of the money from the pharmaceutical companies when they sold their vaccine products to put into this fund to take care of people who are damaged by vaccines. And one of the reasons we did that was because of the issue of autism, although at that time I didn’t know much about it. In any event, the Vaccine Injury Compensation Fund has about $3 billion in it, and the people who’s children have been adversely affected by mercury and have autism have not been able to get anything out of that. They have to go through a process and see a special master, and he has to judge whether or not the information that he has and the information they have lead them to believe that the mercury in the vaccines caused autism. And so far the special masters have not been able to ascertain, according to them, that the mercury in the vaccines does cause autism. The fact of the matter is the mercury in the vaccines causes autism. It’s not the only cause of autism. But now we have scientific evidence by two leading doctors in the Journal of Child Neurology that says without doubt, the mercury in the vaccines does cause autism, is a major contributing factor. Well, I’ve written, contacted Congressman Kucinich, who’s chairman of the subcommittee that deals with this in the Capitol, and I’ve also contacted the special masters that decide these cases and have urged them to re-evaluate all of these cases where people who have autistic children have found that the mercury in the vaccines may have been a major cause. Now we know that it is a cause of autism, and those people who have suffered, and those kids who have suffered need to be compensated out of the Vaccine Injury Compensation Fund. So I’d like to say to my colleagues, I hope you will join me in making sure that the information I just read gets out to everybody. These kids are going to live to be 50, 60, 70 years old, and unless there’s some help for them, they’re going to be a real burden on the taxpayers and on society. We have an obligation to make sure they’re taken care of. I hope all of my colleagues will read this statement tonight and help us to change the attitude of our health agencies and the special masters dealing with this problem. and that a relation does exist between the blood levels of mercury and diagnosis of an autism spectrum disorder. As Drs. DeSoto and Hiltlan noted in their article, there has been a marked increase in the diagnosis of autism in this country over the last 20 years. In fact we have gone from an autism rate of 1 in 10,000 to 1 in 150. So, answering the question of what is (and is not) a possible contributing cause of autism is crucial, not only to the millions of American families currently affected by autism but to future generations. to the thousands of families living with autism to follow the science wherever it may lead. That’s why in late November, I wrote to the Chairman of the House Subcommittee on Domestic Policy, Representative Dennis Kucinich; and the Special Masters assigned to the Congressionally-created Office of Vaccine Program within the U.S. Court of Federal Claims, alerting them to the findings in Drs. DeSoto and Hiltlan’s latest research. Specifically, I asked the Special Masters to take Drs. DeSoto and Hiltlan’s latest findings into consideration as they carry out their mandate of managing and adjudicating childhood vaccine claims. I asked Chairman Kucinich to hold a hearing on the environmental risks of mercury in childhood vaccines before the 110th Congress ends. Given the high stakes involved, scientific reports discussing a connection between blood mercury levels and autism deserve serious consideration and review by the medical and scientific community. During my tenure as Chairman of the House Committee on Government and Reform, I spent 6 years researching and hearing testimony from the autism advocacy and scientific communities about the autism epidemic sweeping our country. Over and over again, questions of causation, namely the use of thimerosal–the mercury-based vaccine preservative–in childhood vaccines were raised. A number of credible national and international scientists testified before the Committee that mercury in vaccines is a contributing factor in developing neurological disorders, including, but not limited to, modest declines in intelligent quotient, autism, and Alzheimer’s disease. And the body of evidence to support that conclusion gets larger everyday. Experience tells us that, as with any other epidemic, while there may be underlying genetic susceptibilities, there usually is also some type of environmental trigger as well–be it exposure to a virus, fungus, heavy metal, or pollutant. There has never, to the best of my knowledge, been a purely genetic epidemic. Genetics alone cannot explain how we went from 1 in 10,000 children with autism spectrum disorders 20 years ago to 1 in 150 today. The increase happened far too quickly for a genetic shift. 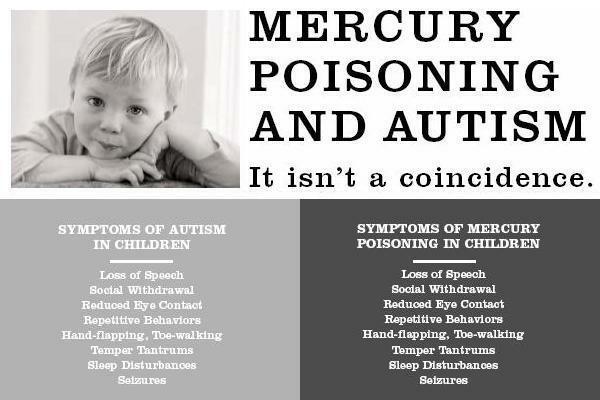 As mercury is a known bio-accumulative neurotoxin, it is biologically plausible that it is a contributing factor to our Nation’s autism epidemic. Autism has no cure, and while it is a life-changing condition, it is not a life-threatening disease. This means that the autistic children of today will be the autistic adults and autistic seniors, 20, 30, 50, even 70 years from now. Our Nation is ill prepared to deal with the complex educational, financial, housing, and health care challenges posed by a generation of autistic individuals. My only grandson is autistic, so this is an issue that is very close to my heart; and for the last several years I have fought hard to raise awareness of this disease, and increase research into the causes of autism, as well as new treatments for those suffering with autism. As a Nation, I believe, we have a collective responsibility to do everything we can to not only stop the further spread of this disease but to help the millions of children, adults and families afflicted with it.